Carmageddon for Tesla, Fiat Chrysler, Hyundai, and Kia. Tesla just reported its worst quarter ever, which means something. It lost $671 million and burned $1.4 billion in cash in the third quarter, on $2.98 billion in revenues. In the three quarters this year, it lost $1.47 billion and burned $3.2 billion in cash. The Model 3 isn’t happening in any appreciable numbers. Only a few hundred hand-fabricated units have been rolled out, with mass-production being woefully behind the company’s silly promises. All this is OK for a young company trying to needle the giants. But its stock price isn’t OK. Though shares fell to $305 in late trading, down 21% from their peak earlier this year, they’re still giving Tesla a market capitalization of an inexplicable $54 billion. In October, according to Audodata estimates, Tesla sold a total of 3,550 vehicles in the US, down 13.4% from a year ago. Tesla deliveries in the US, after a strong first half, have been declining since July on a year-over-year basis. Whatever happens to the Model 3, Tesla is losing ground in the US with its other models. Tesla’s market share in the US in October was a minuscule 0.26% of the 1,354,875 total new vehicles sold in the month. Tesla was ahead only of Maserati and Ferrari – tiny niche brands. Beyond the Wall Street hype, when it comes down to real sales numbers in this vast industry, Tesla essentially gets lost as a rounding error. Among all automakers, total new-vehicle sales in the US fell 1.3% in October to 1.355 million units (delivered by dealers to their customers, or delivered by automakers directly to large fleet customers). On a year-to-date basis, total sales are down 1.7%, which puts the industry 250,000 vehicles behind last year at this time. Of the 10 months so far this year, nine experienced year-over-year sales declines, with September having been the exception. Trucks, trucks, trucks — Texas needs them. Overall truck sales – pickups, vans, SUVs, and small SUVs (“crossovers” because they’re often based on a car chassis) – rose 3.6% to 876,140 units compared to October last year, and are up 4.3% year-to-date. Trucks sales accounted for 64.6% of total sales. Pickup trucks were in high demand. Ford F-Series sales surged 15.9%, their best October since 2004. The average F-series price jumped by $4,000 from a year ago to $47,300! These are high-margin units; Americans don’t mind paying extra for a truck. GM’s Chevrolet Silverado sales rose 6.8%; GMC Sierra sales jumped 25.5%. Fiat Chrysler’s Ram pickup sales rose 1%, producing its best October ever. Nissan’s Titan truck sales surged 29%. Toyota’s Tundra truck sales rose 5.1%. Sales of cars fell 9.1% year-over-year to 478,735 units. The relentless decline continues. Americans are shifting from cars to trucks – as the industry defines “trucks,” which includes crossovers, the cool successor to the station wagon.The industry considers them “trucks” most likely for marketing reasons. 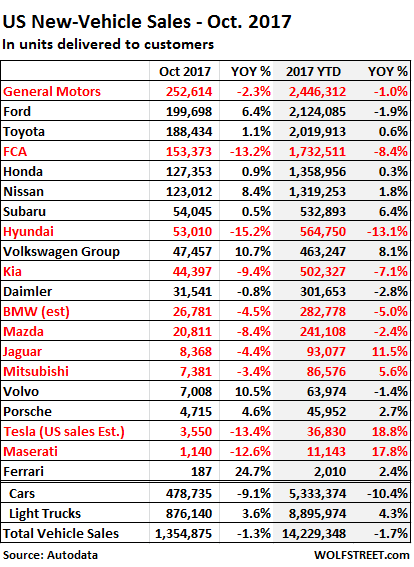 Year-to-date, car sales are down 10.4%. FCA sales plunged 13%, with car sales down 17% and truck sales down 13%. Hyundai sales plunged 15%, as truck sales rose 12% but car sales plummeted 27%, by far the worst of any automaker. Oh, and Tesla sales, plunged 13%. Incentives, according to auto industry consultants J.D. Power and LMC Automotive, were once again over 10% of MSRP and have exceeded 10% in 15 of the past 16 months. GM’s discounts amounted to 13.5% of MSRP. Sales at dealers in the hurricane-affected areas of Texas are booming. This will continue in November. But so far this year, the industry is 250,000 units behind. That’s a big nut to crack in two months, especially since December last year had been very strong, with automakers having pulled all levers to make a go of another record year. So, despite the replacement demand surge, 2017 full-year sales will likely remain behind 2016 sales. Then the replacement demand from Harvey will fade and the underlying issues will creep back to the surface. Saw a story that Tesla has reached a deal to build a factory in China. They’re going to build a factory like in Finland, India, Slovakia, Germany and many many more. Have you heard about any? Elon Mocks is a master of playing with dumb people; he arranges a few employees to meet with some unknown people in this and that country, then starts the rumor that Tesla is going to build a factory in this or that country, or on other planets. The next day these so called investors who all smell of cannabis take stock price of his company through the roof. Watch him the next 2-3 weeks; he is gonna make some claims and bring back the price of Tesla’s shares to just below $400. The thing that got me worried is that Tesla shareholders do not smell of cannabis. It would actually make sense as one could blame mind-altering substances for the blind faith people have in what is effectively a big fat nothing. Those who propped TSLA so high are actually fully in control of their minds. Many of them are highly intelligent and seem to understand perfectly well the company is basically into financial, not automotive, engineering. They are usually well aware not just that Tesla has no unique technology but that it cannot compete with companies such as Daimler and Toyota when it comes to innovation. Yet they buy TSLA shares, hand over fist. Because they have to do something with their savings, at least to try and keep up with inflation. It’s the same everywhere: where once you just bought investment grade securities and sat on them to maturity, these days you have to pile into overcrowded trades, no matter how rotten they are, just to stay ahead of that inflation that officially doesn’t exist. Give me investment grade bonds with the same yields we had in 2008 and you can have your long awaited stock market crash. Various other Synthetic mind altering substances are basically odorless. Cannabis users although a pain to deal with are much easier and safer to deal with tan those on go fast. free food can instantly resolve many issues with Cannabis users. MC01: No, I’ve met a few retail investors; they believe in Elon Mock; it doesn’t matter what Tesla does on Earth or on Mars. He is their prophet. They might not be exactly on cannabis, but they definitely are on something. As for buying stocks of a fake company to stay ahead of inflation, you should ask shareholder of Enron how much they stayed ahead of inflation. “Yet they buy TSLA shares, hand over fist. They think Tesla is Apple and Daimler and Toyota are Microsoft. While I personally agree that Tesla is overvalued, it’s clear you don’t understand what the valuation premise is there for many buyers. It doesn’t really have anything to do with building a factory in this or that country (or cannabis). It’s a long-term bet on them dramatically disrupting the automotive industry in the next 10-20 years. It’s not about the Model 3. If your basis for judging it’s valuation is on current sales– or any other traditional fundamental metric– then you are missing the big picture. You’re (metaphorically) the guy who 15 years ago was looking at Amazon’s fundamentals and screaming it’s overvalued while ranting about Jeff Bezos and weed and completely missing the bigger picture. He puts Steve Jobs to shame. But then again, we live in an era of dumb money (I mean just look at the cryptocurrency ICO non-sense), so hype artists like him are boldly going where no hype artist has gone before, pushing the envelop. People bring the Amazon example all the time when it comes to Tesla. But Amazon is an exception rather than the rule. Besides, the automotive business is very different both in terms of capitalization needs and competitive environment, compared to the books business. Sears should have been Amazon. Something went BADLY wrong in that company. They had it all except the computer, Before WWI, and they let Bezos take it away. I still wonder if some people at sears got paid to fail. Smingles: Not only Tesla is not Amazon, but Amazon itself is hugely overprices. Amazon has to raise its profit 20 fold to just have a valuation around 15. That is 20 fold, for a company that has turned in profit only a few quarters in 23 years. Just cause there is dumb money to chase these stocks, it doesn’t mean they are profitable, or will be profitable. I always suspected Elon Musk is a con man; but wasn’t certain. A few month ago he proved to me to be a con man when he started talking about building a city on Mars when Tesla’s shares were falling; right away Tesla’s stock started to rise again. That is is the classic work of a talented con man. A bad comparison to use against Tesla. MC01 – Exactly. I’ve seen very intelligent people fall for scams like “viaticals”, “allodial title” to land, various sporting/political groups known for sending out bales of snail-mail “give us money” propaganda, and hell, even more generally approved scams but scams all the same like college. Human beings have an infinite capacity for self-delusion; that’s enough to explain all of this. hmmmmm, I heard they were building one on Mars. That is what the automotive business news is reporting . Change the corporate name from Tesla to “Uber-sla” or Snap-sla” or “Blue Apron-sla” and shareholders won’t expect a return on investment; in fact, they will overwhelm you with cash contributions. The Motley Fool ran a constant campaign to pump Tesla. That’s one of the reasons its stock has done so well. I doubt The Motley Fool moves the market. The electric car may be the disrupter, but that is unlikely to be Tesla. History is full of pioneers and early adapters who were swept aside once the idea became mainstream. The UK unfortunately abounds in these: radar, first jet airliner, (the ill- fated Comet), video tape. mag-lev rail etc. He was saved by a no-nonsense, totally focused business manager who once nailed shut the door on a rail car to stop Ford from doing last minute changes to a shipment of cars. If Tesla, against all the apparent odds, is to be saved from the invasion of the majors, someone has to get him to focus on this Model 3 to the exclusion of his myriad other interests. It is probably too late, but if there is a chance, that is it. radar, first jet airliner, (the ill- fated Comet), video tape. mag-lev rail etc. Aircraft Carriers, Television, Nuclear weapons, and Heat seeking/guided anti Aircraft/Ship missiles, all attributed, to the US. I think investors are patient with Amazon because it has meager but positive cash flow. Tesla is another story. It’s hard to swallow continuous cash flow losses of that magnitude. Why wouldn’t the losses be even larger next quarter? Time to run for the exits. It does seem like folks would get tired of the old “Let me pull yet another rabbit out of my hat” routine. This stock and the Burrito shop CMG always struck me as the perfect short plays . Tesla has NO chance against the large auto makers,who’s EV programs are well advanced and have a huge lead in the very complex process of actually building product on a large scale. the only hope for Tesla investors is a buyout trough a Chinese auto maker in need of their battery tech. at 320.00 a share i find even that doubtful. GM’s Bolt already beats them at their own game at a fraction of the cost,readily available at you local dealer. I guess you forgot; Tesla doesn’t have a battery technology; Panasonic does. But from my understand, the battery tech itself is far from being Tesla competitive advantage — it is the battery management software. Unfortunately for Tesla, their batteries IP is owned by Panasonic, which also manufactures the units themselves. If a Chinese manuafcturer such as Geely or Great Wall wanted the tech it would just be cheaper for them to strike a deal with Panasonic (or another hybrid/EV battery manufacturers such as GS-Yuasa or Johnson Controls) than buying a stake in Tesla. Speaking of which I am honestly surprised the Chinese aren’t out in full force to clone these batteries: they surely don’t lack the retro-engineering capabilities and like it happened with everything else the patent holders will simply consider this “small” issue part of the cost of doing business with China. Surely the basic Lithium- ion battery introduced by Panasonic in 1990 is off patent by now? The GM Bolt costs more and looks like someone beat it with an ugly stick. Not to mention the interior reminds me of a circa 1990’s Pontiac with all that plastic. Everyone thinks of Amazon as the “winner” from the first technology bubble. But I think it is more like a 1960s style conglomerate, with most of its various business units having almost nothing to do with each other. And its most profitable unit, AWS, is only making (a little) money right now because we are neck deep in one of the largest tech bubbles of all time, which is stoking price-insensitive demand for its services. Tesla is certainly a bankruptcy waiting to happen, but if Amazon’s limitless access to free money ever ends, there is a non-trivial chance the online giant either seeks bankruptcy protection or is broken up. But yoy year to date sales up 18%, more than any other car maker. Seems wrong to focus on one month. And at this rate they will catch Porsche pretty soon. He’s bit off a lot, future still murky. As I said in the article, sales growth was strong in the first 6 months (through June) but then started to decline on a year-over-year basis. That’s four months of year-over-year declines in a row. This is a serious problem for a supposedly high-growth company with that kind of silly valuation. Tesla quality control leaves a lot to be desired, it seems. get your tesla while you can , they will become collectibles . Remember the Delorean ? Sell your tesla while you still can. Remember the Pinto? Dont leave out 1 or 2 other disastrous early japanese clones marketed in the US under odd names by both GM and Chrysler. Only hitting on Ford exhibits a very bad bias. You can get work, on the regular or undocumented economy, with a pickup truck. You can collect scrap metal, do deliveries, help people move, take stuff to the swap meet etc. You can also put a camper on the back and sleep in it. I could not afford to even keep a car if someone gave me one, but if I was given a pickup truck, I could possibly afford to keep it doing things like this. This is how things are for the 90%. As the article pointed out, the average price of the Ford F-series in Oct was $47,000. So who is buying the damned things? My wife has two MAs and I have a Ph.D. and we will be lucky to gross, gross mind you, $72,000 this year. The median family income is between 49 and 51k depending on which stats you believe. I can’t see how 2/3rds of families can even begin to afford a $47k expense. Wolf – I mean buying a used truck. Buying a new car/truck for me is about as achievable as buying the Computer History Museum outright and changing the name to the Alex History Museum. Nope, for people in the real world, it’s trading $1000, some stolen MRE’s and a guitar for a truck that just barely passes smog. Lolz. Where are you living… under a rock? In California a framing carpenter makes: 90K base up to 150K in overtime. So far 2 of us have 3 Masters degrees, 1 Australian honours degree, 1 BS,1 BA between us and the kid is more than half finished with her PhD…. I used to make a good income, but now I don’t. In my previous job my income was less than the income tax that I paid when working full time before being let go. What a thrill taking a 80% pay cut to find work. Bricklayers make more than doctors here. Off course they do, especially out west. They also have to drink 10 liters of water a day at work, just to stay alive but only need to go to the bathroom, once a day. And can only do this for a short number of years, before their mistreatment of their bodies starts to catch up with them. Doctors work in air-conditioned luxury. Number of Au Brickies in their 80’s VERY FEW, number of Au Doctors in their 90’s MANY. Au is one of the few places, where Tradies/Miners ETC, get paid what they are worth, compared to other earners. For some obscure reason, most of the “Other Earners” in Au, dont like that. Who/What pushed TSLA stock price into the stratosphere? 2. Some or most of the investors are waiting for the musical chair to pass on their stock to someone more gullible than them? 3. The market is so distorted with QE that all stocks are up in the stratosphere ; at least all with the hype and Tesla has the biggest type of them all. Doesn’t Tesla/Gigafactory/SpaceX and other operations get DOE grants and subsidies? Then there’s tax credits to buyers and companies that supply sustainable energy parts for batteries, motors and re-charging equipment? How does all that figure in to the accounting? You bring up a good point, Randy. I personally think Lone Suk’m is a front for a cartel that’s cashing in on all those juicy govt subsidies while some of his pals are doing a slow-mo pump-and-dump with the various associated stocks. Remember that he never “invented” anything and it’s painful watching the so-called genius, ah, speak, er, about, um, anything, ah ah, technical, er I mean, off the, um, cuff. If it’s canned marketing-speak however, he is great at regurgitating. The difference in delivery is stark. Tesla was already a going concern by the time he joined. Also, have been watching the SpaceX **landings** and there’s something plenty suss about them. (Miles out at sea, always dodgy/distant cams, employees on NDAs, no manoeuvring of vehicle AT ALL despite choppy wave conditions…gimme a break!) Defies all principles stated in several physics books I’ve owned and read. I don’t have a clue what’s really going on with the rockets, but it just don’t smell right. I live next to Kennedy Space Center. I’ve seen them land, on land. I’ve seen one that landed at sea returning to KSC being towed through Port Canaveral. They land them at sea to reduce the fuel required to get them all the way back to KSC. In that case, Kent, I’m glad to get rebutted by A Real Person! :) However, I still think he’s a loser. From a financial point of view, Elon Musk is certainly not a loser. On 23 August, Forbes put his net worth at $20 billion. Rocket technology dates back to Nazi Germany, but most of the energy needed is to simply get the payload up off the ground. A much more efficient method is to use a 747 (or other large aircraft) to tow the payload to 6 or 7 kilometers altitude to be released at around Mach 0.8 or so. Then the rocket(s) can do their job to carry the payload to orbit or beyond. While studying physics at the U of MN in the early 1980s, many of my professors thought NASA made a mistake in the design of the Space Shuttle for this reason. @Dan Romig: Of course, I always take everything Forbes writes as pure gospel. [/sarc] Looked at their valuation of Fakebook recently? I agree with your physics though, Dan. Towing up to maximum altitude before deployment *is* the more energy-efficient way to go. Just because NASA didn’t do it, though, doesn’t mean the shuttle was the better way to go. VHS vs Betamax anyone? Sure that example of his way of talking wasn’t copied from a former boss of mine? The 30 year old d**khead couldn’t put more than two words together without an um or an ah in there and the guy was pulling down around $A200,000 a year base. A total waste of space, but making big bucks. I always have to chuckle when I read things like this. Yes, Tesla receives subsidies. As do the Big 3. As does VW. And BMW. And Nissan. And so on and so forth… (subsidies to the Big 3 dwarf Tesla). So will Tesla fall or be bought? What do you guys think? I don’t think any company will buy Tesla at the current price. Why buy it, Panasonic has the Tech with a future. Tesla is simply the first disruptor in the upmarket sector. That Market sector, will be happy buying the next overpriced luxury green vehicle, as it is with Tesla. simply to play the Status symbol game. Not at its current market cap, and with its liabilities, why not let it go into reorg and pick it up any pieces for pennies? Lincoln offered a pickup for several years, but times got tough. Tesla should give that idea a try. I think that mean chicken is onto something. Ford F-150, GM trucks, and Ram are all more or less the same. There is surely an opportunity for a different kind of pickup, and Tesla could move into that spot. It looks like this: Battery powered electric truck, cab forward, 4 wheel drive, dump bed with fold-down sides and a tail gate, the interior dead simple–no hidden fasteners, no plastic, no touch screen–exposed bolts if you need to take something apart, radio with two knobs–one for volume, one for the station, etc. And if you’ve been mucking out stalls or been down in a muddy hole repairing a water line, you can just hose out the interior. Kind of like a 1970’s era Mercedes Unimog, except electric. Detroit interiors are like stepping into a fancy spa–you don’t dare get in if you have mud on your shoe. They just don’t get the concept of Work/Truck. The kind of truck I just described is readily available in Asia and Europe, except that it’s diesel rather than electric. I would buy one if it were available. Here in my part of Europe the most widespread pickup truck is the Toyota Hi-Lux. You have probably seen it as the favorite vehicle of Third World warriors in the news. Hell, the war between Libya and Chad in the 80’s was even named “Toyota War” due to both sides (plus French legionnaires supporting the Chad army) making large use of this pickup truck. Used Hi-Lux go for insane money regardless of year, mileage and often conditions. They have a well deserved reputation for being able to withstand pretty much any abuse thrown their way and to be easily (albeit often not cheaply) fixed. The problem is these trucks are very expensive when new: rugged reliability comes at a price these days. That’s why competition has sprung up. But look at second hand prices for Ford’s, Great Wall’s, Mitsubishi/FCA (same truck, different badge) etc. Nobody wants them, or at least nobody who has to use them for work. But they are cheaper than Toyota and sport trendy lines, so they always find buyers, especially during no money down ultralow EAPR promotions. I don’t know why Toyota doesn’t sell this truck in the US as well given they sell it pretty much everywhere else with a variety of both diesel and gasoline engines. I AM LOOKING AT ANOTHER YARD FULL OF NEW ONES, NOW ALL ALREADY SOLD. In the US/Mexico Toyota makes the Tundra/Tacoma which is a bloated overpriced piece of garbage. As it wanted and has taken part of the US truck market. This FUEL GOBBLING Toyota vehicle, tells you what the deal is in America, with pickups.. In the US there is no Traditional Hilux, or traditional Landcruiser. On, no, what do those of us who live on Mars do without Tesla’s electric cars? We’ll ride in his death tube. The Boring company is so exciting! I’m looking forward to the day when I’m able to download lifelike celebrity personalities into my personal cyborg/android robot blank. Imagine the multiple personalities that technology could produce. I can point out many people who I consider far far smarter than me, but even these guys have to concentrate on one thing at a time; technology and science has become too complicated to allow anyone to be involved in multiple disciplines at the same time unless they have just a superficial understanding; deep understanding takes time and effort. Seems to me this Elon Musk watches a sci-fi and likes the idea, and says let’s start a company based on the sci-fi I watched last night. Good luck making money with a guy who doesn’t even have the ability to concentrate on one discipline and learn it well before moving on to another discipline. People who can’t concentrate are generally of average or lower than average intelligence. At this point, he plays the celebrity endorsement-kind of role in these fringe ventures, just like Floyd Mayweather endorsing an ICO to attract the dumber money. If life is a simulation as Elonski theorizes, then no need for cars, tunnels, going to mars, etc. Just bring the simulation to the people while they veg on their couches – simulated couches, that is. FYI since the failed VW takeover the Porsche business is fully owned by VW and should be included in VW group numbers like Audi, Bentley Lamborghini and so on. The remaining Porsche SE, which can be traded on the stock markets, is a holding company and its biggest assert is a large portion of VW voting shares. Agreed. There are other inconsistencies on the list, including Maserati, which is owned by FCA. But that’s how industry data provider Autodata lays it out. Same with Germany where it is alleged no real testing of Tesla vehicles took place, where Deutsche Bank (part owned by Government) are holders of significant Tesla Stock. Or where Germany had to GIVE FREE ELECTRICITY TO utility companies as so much was generated from cash guzzling subsidy driven renewable energy, but where no consumer gains as like the UK they pick up the cost of renewables in terms of billions of euros in subsidy, and index linked and guaranteed electricity prices for 25 years. In the UK it from 48p per KW guaranteed let alone any CAPEX subsidies all index linked and guaranteed for 25 years, but they choose only to mention how one day this year it dropped the wholesale price to MINUS 1.9p per KW…..A hollow victory when they are forced to pay 48p plus extra subsidy for 25 years index linked! A lot of people seem to want him to fail for some reason. Not sure why. We like to see legitimate, hard working, honest people win, not con men. Unfortunately, reality is the exact opposite; con men win at least 90% of the time. “Analysts” shilling for Tesla, trying to lure more marks into buying yet another insanely overpriced stock. Eat at Sheetz – and get gas. Actually the electric motor is being tested in semi tractors where it makes a lot more sense. If you have a 1000 lb battery for instance, but an 80000 GVW the offset in extra weight is marginal. The average semi has about the same horsepower as the family car. The typical engine design requires high torque, at low RPM, and a system of transmissions. The automatic transmission has replaced the manual, and with the right torque converter it can work. DOT only allows ten hours of continuous operation, which is a problem when trucks go driverless and electric., but in the old days they use to drive in teams, now your team is a team of batteries. In the 2025 remake of Back to the Future the professor will drive a Tesla. Isn’t that close to the median income of an American household? Absolutely astonishing. Yet I see them all over the place. That would be median yearly income! Oh the joys of finance. Sells lots and lots of stuff. Astonishing is right. Electric cars can’t compete with ICE and can’t be built without ICE. So what’s up Wolf can’t handle a little truth? You’ve blocked my comments because you were wrong on electric cars. I wonder how many other comments have been blocked. Your first comment that you posted (as “Ed”) 5 minutes before you posted this comment automatically went into the moderation queue because you’re a first-time commenter (with the email you used to sign in). That happens to ALL first-time commenters. I release those comments when I get to them. And your first comment has been released. With a little patience, you could have avoided writing this second comment. Your first comment was wrong about electric cars. But that’s fine. I have no problem with that, unless you keep posting the same stuff (violating rule #4, “broken record”). I’ve said plenty of outrageous things that Wolf had and has the right to block, and I know he disagrees, and I absolutely am convinced he doesn’t approve of my wordings at all. Yet, I have not seen him block me once; and if he does in future, it just shows that I have crossed the final red line. On any other sites, including Yahoo finance and news, comments are censored left and right not because your comment is objectionable, or wrong, but simply because the moderator didn’t feel like it. Wolf is extremely tolerant. The problem with Elon Musk, and Tesla, is his inability to scale the business quickly. Sure, you can make a case that TSLA is a long bet, but at this rate Tesla will be out of cash in a year. Then what? How many infusions of investor capital will it take to scale this business? And get to Mars? Musk calls these capital infusions euphimistically “resources” for a better life, but investors will tire of providing resources (money) to a man with a personal net worth $20 billion. Maybe that is why people resent him. I personally believe his aspirations of “multiplanetary life” as described on his SpaceX website are not feasible nor realistic. Esp by 2025? No way. Everything for life on Mars has to be brought from the earth. Where will the energy come from? Batteries? According to physics, energy travels one way—> entropy. It has to be renewed from another energy source and to date, this technology doesn’t exist outside the conventional, and increasingly costly, energy sources. A NASA scientist friend of mine once told me that the bio-nutrients and atmosphere necessary to grow plants on Earth don’t exist anywhere else but Earth, and never will. So multiplanetary life is impossible and always will be. Taking care of this planet therefore needs to be an important goal. Completely agree with you and your scientist friend. You’re certainly right, but these characters are convinced that, once they’ve extracted every last bit of wealth from the Prolz and every last resource from planet earth, they’ll merrily hop to another planet, where they’ll live forever on blood transfusions (a la Peter Thiel) and organ transplants from young people brought along in steerage. By the time a new planet is found, cybernetic bodies will have been developed to download into. With AIs and robot servants a la Westworld, no need for us Prolz at all, not even in steerage! Maybe THEN those f*ckers will leave us the f*ck alone, although odds are against,. Tesla’s biggest problem is much more capable mfrs will be flooding the market with electrics in 2018, many of which will be better and cheaper than anything Tesla can’t seem to deliver. The cancellation of the electric car tax incentives will cause all those programs tone canceled. These federal tax rebates are limited to the first 200,000 cars per brand. If Tesla were able to produce the promised number of cars in 2018, it would hits its per-brand limit of 200,000 sometime in 2018. So the cancellation of that program wouldn’t make a lot of difference for Tesla. But it would make a big difference for other automakers that are still far from their limit. If Tesla goes bankrupt a large amount of QE excess liquidity will evapourate. Car sales in the UK just plunged by 12% in October. But fear not, Everything is Awesome! Buy moar stawks!